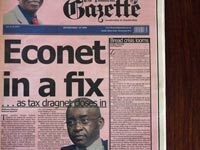 A local weekly paper, The Financial Gazette, headlined today with “Econet In A Fix As Tax Dragnet Closes In” and went on to explain an tax issue where Econet is said to have been paying less duty on base stations than they were supposed to since 1998. 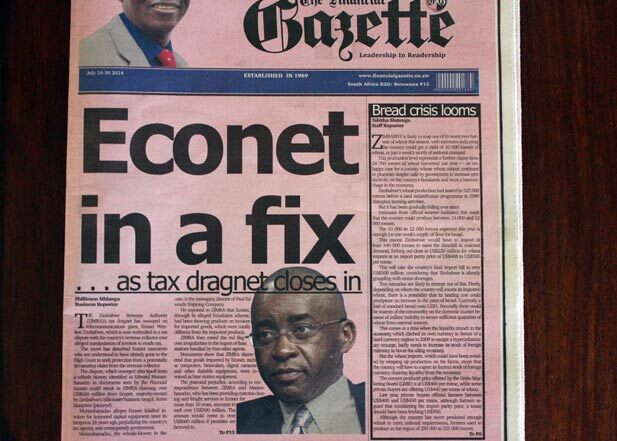 It’s serious to the extent Econet could be made to pay $600 million by ZIMRA. How did it happen? The Fingaz article is pretty long read so we’ve distilled it for you. We’ll update as needed to clarify anything. A Whistleblower, who has been Econet’s clearing company for more than 10 years is telling on them. In 1998 duty was waived on parts for base stations. Under duty tariff 8525.2020. The Whistleblower says Econet has been allowed to use this waiver on all imported goods and base station equipment since then. He says in total Econet has imported 56,500 containers which were cleared as base stations. In December 2013, ZIMRA wrote a letter to the Whistleblower’s company requesting to know how the shipping company cleared 59,682 base stations for Econet and yet ZIMRA knows of only 2,500 base stations that Econet has. It’s not clear if ZIMRA’s letter was written after Mutambanadzo had blown the whistle or before. The whistleblower is a guy named Edward Mutambanadzo, the managing director of a shipping company called Paul Edwards Shipping Company. There’s a lot of incentive to blow the whistle on something potentially big, as this case is. Whistleblowers get 10% of the value of the value. That’s a potential $60 million of the $600 mil. It’s not clear if, beyond his cash commission, Mutambanadzo had other characters and agendas behind him. Normally, the whistleblower would have done his job and gone behind the scenes but seems there may have been some corruption involved. The fingaz says some of the ZIMRA officials on the case undertook to thoroughly investigate the matter on an understanding that the whistleblower would share his loot with them. The fingaz also lightly suggests ZIMRA officials may have fed case information to Mutambanadzo so he would whistleblow and they would share the spoils. Such corrupt practices, the Fingaz says, are not without precedence in Zimbabwe. ZIMRA officials, apparently made a u-turn on Mutambanadzo and started negotiating with Econet. It’s not clear in the article if these negotiations were similarly corrupt or now as official taxman business. Whatever the reason, the whistleblower wasn’t amused so he told on the officials handing over document evidence and audio records. Through investigation however, ZIMRA determined that Mutambanadzo’s information wasn’t useful as ZIMRA was already investigating the matter when he blew the whistle. If telecel hadn’t paid they would be under investigation and clearly they aren’t. Inspired to evade tax. It wont be surprising when nothing turnsup or some information like ict equipment had waived duty or Something along those lines. Zimra … Does Alfa and Omega Dairy pay duty for its equipment too? We knew it Zimra knows that Econet is making money,and it’s a well organised company and they now planning to destroy it why where you silent since 1998. The way the government want to sustain itself by strangulating the nation is unsustainable and will definately backfire. Money is not made from false claims such as radio license for non existent radio station, PAYE for closed firms, false traffic offenses. People are just now sick and tired of all these foolish desparation by government. What happened to Happison Muchechetere and Curthbert Dube? The biggest tax evaders are cabinet minister that is known and its a fact. Since 1980 no govt minister as open declared wealth and yet all of them are worth millions in US dollar.